This new roofing and sales CRM has many features and functions the industry has desired but has not been available from other software suppliers until now. Genesis Contractor Solutions has added another offering to its portfolio of services and products for the roofing and restoration industries. Located in Englewood, Colorado, Genesis has developed a proprietary Customer Relationship Management (CRM) platform. The product is now live and available for a 30-Day Trial. “We’re turning the materials ordering and cash flow problem on its head and allowing our contractors to experience exponential growth,” said CEO and Founder Jeff Posey. “The CRM known as Beanstalk Solutions, is the platform that brings it all together, allowing the contractor to do everything he needs all from one convenient app location.” Beanstalk Solutions CRM was built with the salesperson in mind. Its ease of use and automation is a refreshing change. Owners will find great benefit in its flexibility and reporting capabilities. Numerous features and functions never before offered by other software solutions are now available. With just the click of a button, users can request capital received in just 48 hours and initiate the claims management process to maximize claims. Additionally, users can unlock unlimited credit lines to purchase materials and take advantage of large discounts and rebates. Powerful integrations planned for the CRM include the EagleView® Roof Measurement & Aerial Measurement Service, Intuit QuickBooks®, Google Maps, HailTrace and more. Mobile app functions are usable in the field even where there is no cellular or WIFI service. Salespeople enjoy the convenience of uploading photos and documents with no impact to their smartphone storage. A particularly innovative feature of the app is the ability to use Optical Character Recognition (OCR). With OCR, you can take a picture of the insurance loss sheet allowing the data to auto-populate into the app. No more human errors or time needed to manually input data. Another important feature highlights communication. Text customers, management, salespeople or subcontractors directly from the mobile app or desktop. Beanstalk CRM automates fast and efficient information distribution to selected recipients. Documents are professionally formatted and reproduced with clarity and consistency from any device. On site credit card processing available through the app eliminates loss of payments for deductibles and allows for upgrade selling and extended warranty offerings. It also reduces the need for multiple trips to the job location. Genesis Contractor Solutions is the industry leader in innovation and technology. Persistently driving the growth, success and satisfaction of its contractors and their customers, the homeowners, is the ultimate goal. Since its inception in 2014, Genesis Contractor Solutions is always striving to take the industry from archaic to modern and beyond. “We strive to raise the industry bar in a variety of ways, both through our services and also through our non-profit arm known as StormScamHelp.com,” said Posey. 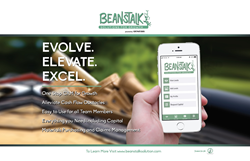 Officially launching Feb. 1, 2018, Beanstalk Solutions CRM is the latest tool in its revolutionary tool box. Go to http://www.genesiscontractorsolutions.com and http://www.beanstalksolution.com for more information.